Carden Angus Beef cattle are not fattened on corn or grain in a feedlot. They are turned out in May and left to do what they do naturally, grazing. We use low stress methods when handling which makes for calmer, healthier cattle that gain more. This is good for both the cattle and us and produces beef that is relaxed and, as a result, very tender beef. No Herbicides or Pesticides in their food sources. 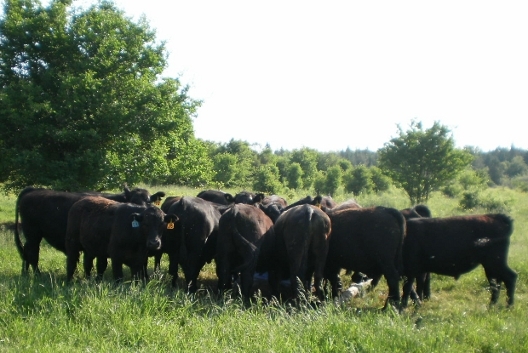 Carden Angus Beef respects the grassland, wildlife and aquatic habitats. 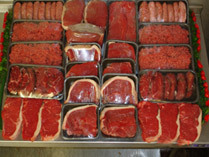 Carden Beef engage in the 100 Mile Diet and reduce the demands made on our shared environment. Carden Angus Beef Cattle are certified Angus Beef. We are also a member of the Ontario Federation of Agriculture. We are members of the following associations.